Anyone know how to get the front axle out of the front diff 03 kawasaki prairie 650 one side just pulled out the other side being the left I can not get out. 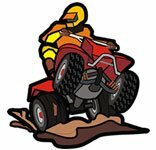 I'm looking for some advice on re-building my front axles on a 2002 Suzuki Quadrunner (ltf500f) My left front outer joint sounds like a popcorn machine when I make a sharp turn. I looked on Ronnies and they want $429 each for a complete shaft so that is out of the question! Has anyone here fixed their shafts on an "as needed" basis? I generally use the quad to plow snow and for yard clean-up in good weather. I just recently put a set of ITP Mudlite XTR's on for plowing, so I'm sure they "helped" the shaft fail due to the extra stress from the added traction. I'd like to hear your story about re-building your axles. Thanks. I need to replace the u-joints on the front driveshaft. I am having trouble getting the axles out to remove the differential. Might need advice on removing the driveshaft as well. 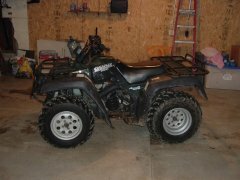 1995 350 Yamaha Wolverine 4x4. Are the dif gear splines harder material than the axle splines? If so can I replace just the axle itself? Also what other years and/or models interchange? Rebuilding the rear axles on 97 Polaris sportsman 500 4x4. The axles are the u-joint type with the spline joint. Have replaced bearings. When I replace the rubber boots on the spline joint, what should I do as far as re-greasing the spline joint? I have the repair manual, but it says to take them to the dealer to be repaired. Hey guys and gals, I recently bought a 1994 yamaha big bear 350 with... surprise surprise.. rear diff problems. I have taken the rear diff all apart and the problem is the pinion bearings are both screwed. (Hope Im using the correct terms) Anyways there is a collar that has 4 "divets" in it that ya can beat on with a punch and it should turn. Well Ive beat on that collar and it is not turning. I have lubed, soaked, heated, cooled, you name it, and that collar will NOT budge. So as a last ditch effort before I take a die grinder and grind that collar outta there, I thought I would throw a post in here, and maybe someone has some trick or advice they can add that maybe I havent thought of. Now the axle, taking it out needed a beating, and I ended up screwing up the threads that hold the hub on, and eventually broke them right off. My plan is to drill about an inch hole in the end of the axle, thread it, thread a grade 8 bolt in there, loctite it in, then throw a bead of weld around the bolt. 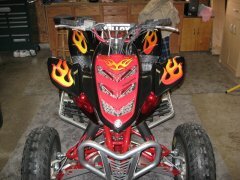 Im thinking for the little light duty puttering around I do with this quad, that this idea should be enough to repair the axle so the hub stays on, rather then fork out big bucks for a used or new one. Thoughts on both repairs would be great! Hi Guys Ive been racing for a while now but I've noticed that the bikes I race against seem to have a wider axle not sure if thats the right term then the one I currently have on. Now wen I take corners my bike always lifts up instead of being flush. Should I change my width on the rear axle? i just got another rear bearing carrier off ebay and before i put it on i need to find out how much to tighten the axle. Also, i just saw a pic on this site and the axle nuts are on the right side. Mine are on the left. Does it matter? I have a grinding ,jumping sound coming from my front axle differential sometimes. Has anyone tore into one of these front ends?